Colonel William Light, 27 April 1786–6 October 1839, was a British military officer and first Surveyor-General of the Colony of South Australia. He is famous for choosing the site of the colony’s capital, Adelaide and designing the layout of its streets. Light was born in Kuala Kedah, Siam (which is now in Malaysia) and grew up in Penang until the age of six, when he was sent to England to be educated. He was an illegitimate son of Captain Francis Light, the Superintendent of Penang, and Martina Rozells, who was of Portuguese or French, and Siamese or Malay descent. Light died of tuberculosis in Adelaide. Light was initially considered for the position of Governor of South Australia – this was, however, given to Hindmarsh. Instead, in 1835, Light was appointed Surveyor-General of the new colony. He sailed for South Australia with his mistress Maria Gandy (his second wife having left him for another man) and some of his staff on the Rapid. There Light selected the location and laid out the street plan of the city of Adelaide. The city was planned by Light in a grid fashion with the main streets running east to west to avoid the dust storms blowing from the north. One of the reasons he chose the location was because clouds drifting over the nearby Adelaide Hills would provide rainfall. This was a promising indicator of good conditions for agriculture. Another was that the location was adjacent to the perennial creek grandly named the River Torrens; the available supply of fresh water was a problem for the new colony, and had resulted in the rejection of, or relocation of, settlement sites on Kangaroo Island, Port Lincoln and Holdfast Bay. When Colonel Light was designing Adelaide, his plans included surrounding the city with 1,700 acres (6.9 km2) of parklands. This would provide clean fresh air throughout Adelaide. European cities often had polluted stale air and Light wanted to avoid this occurring in Adelaide. Ironically, white settlers denuded the Adelaide Plains of trees in the first decade of their settlement. It is sometimes claimed that Colonel Light also designed the city of Christchurch in New Zealand. However, this is not possible; Light died in Adelaide in 1839, whereas Christchurch was not settled until well into the 1840s. Christchurch was designed by Englishman Edward Jollie in March 1850. Extracts from his diary in 1839 are quoted on a plaque attached to the statue, and highlight the difficulty Light faced in having this site chosen. ‘The reasons that led me to fix Adelaide where it is I do not expect to be generally understood or calmly judged of at present. My enemies however, by disputing their validity in every particular, have done me the good service of fixing the whole of the responsibility upon me. I am perfectly willing to bear it, and I leave it to posterity and not to them, to decide whether I am untitled to praise or to blame’. Legend has it that this was the spot from which the Colonel chose the site for the city. 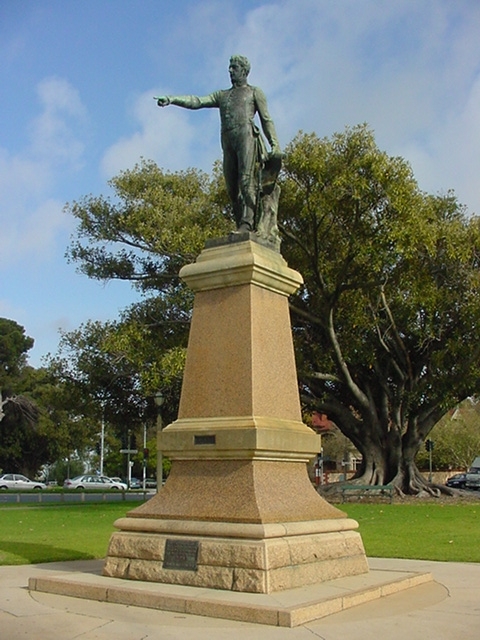 The statue that is located overlooking the city of Adelaide is believed to be the spot where he first stood and surveyed the flat plain which was soon to be Adelaide. However, the first place could have been at the corner of North Terrace and West Terrace which is now dominated by the Newmarket Hotel. Light’s design for Adelaide is noted as one of the last great planned metropolises; the city’s grid layout, interspaced by public squares, has made it an ideal modern city, able to cope with traffic, and the Adelaide Parklands that surround it provide a “city in a park” feel. Light resigned from his position in 1838, after refusing to use less accurate surveying methods for country surveys, and formed a private company. In January 1839 the Land and Survey Office, and his adjoining hut (along with that of James Hurtle Fisher), burned down, taking some of the colony’s early records and many of Light’s diaries, papers and sketches with it. Light spoke several languages and was an artist. Many of his sketches were published in London in 1823 and 1828, and a number of his works and incomplete self portraits are displayed in the Art Gallery of South Australia on North Terrace. Colonel William Light designed a layout and development programme for the city. This project is now known as Light’s Vision. Legend has it that William Light stood on Montefiore Hill (in North Adelaide) in 1837, pointed at what would one day become the central business district of Adelaide, and immediately began planning the city. This moment is commemorated by a statue by Glaswegian sculptor Birnie Rhind on Montefiore Hill (moved from its original Victoria Square position in 1938), pointing at the City of Adelaide below. One noticeable aspect of Light’s plan was that the city was laid out in squares, creating a grid-like pattern that has been an asset to the city in recent times; reducing the possibility of congestion, or grid-lock. Light’s decision on Adelaide’s location was initially unpopular among the settlers, including with South Australia’s first governor, John Hindmarsh, but Light persisted and eventually managed to convince Hindmarsh. William Light was the son of Martinha Rozells and Captain Francis Light, founder and governor of Penang. He was born in Kuala Kedah, Malaya on 27 April 1786 and baptised on 31 December of that year. For much of the time William was looked after by his sister Sarah who was seven years his senior. At the age of six, young William was sent to Theberton in England to be educated. When only fourteen years old he joined the navy. 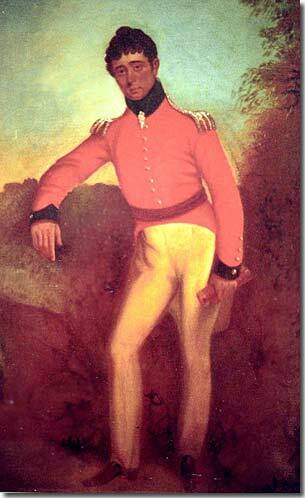 At twenty-two he served with the Dragoons in Spain and Portugal and in 1811 was appointed Lieutenant. A year later, during the battle of Badajos, he was attached to General Graham, later Lord Lynedoch. On 16 October 1824 he married again, this time to twenty year old Mary Bennet, daughter of the Duke of Richmond. They went travelling all over Europe but particularly France and Italy. After he had bought the yacht Gulnare, he and his wife sailed the Mediterranean and Light produced some of his best sketches and paintings. Later he went to Egypt were he worked with John Hindmarsh for the Pasha, ferrying troops and equipment to Syria. It was during this time that Light met Dr John Woodforde who would also find his way to South Australia. Woodforde’s son John later worked at the Sliding Rock mine. Light separated from Mary in 1832. In 1835 Hindmarsh was appointed Governor of South Australia and recommended Light for the position of Surveyor General, with a salary of four hundred Pounds. Light sailed from England on 1 May 1836 on the 162 tons Rapid to take up his new position and arrived at Kangaroo Island on 20 August 1836. He was not to have an easy or happy life in the new colony as it was often plagued with personal or work related problems and bitterness. His small party included, among others, Boyle Travers Finniss, William J.S. Pullen, Dr Woodforde, James Lewis, William and Edward Gandy and their sister Maria who became Light’s mistress, W.H. Neale and William Jacob. The remainder of the survey party, with George Strickland Kingston, sailed in the Cygnet. Light was not impressed with Kangaroo Island as it had no surface water and very little arable land. Because of this he relocated his survey party to Rapid Bay before starting to explore Gulf St Vincent. Unfortunately, before any site had been surveyed properly the first shiploads of migrants arrived at Holdfast Bay. By the end of November, Light had made up his mind about where the harbour and Capital of the new colony would be located. Not everyone agreed with his decision, in particular Governor Hindmarsh, who as a sailor wanted the capital on a coastal site. Light’s decision was also criticised in England. He had ruled out a site at the Murray mouth, Yorke Peninsula and Port Adelaide and later Victor Harbour. To decide the issue of the site for the capital, Governor Hindmarsh ordered a public meeting on 10 February 1837. At this meeting it was agreed that only those people with landorders could vote. Light’s site of Adelaide received 218 votes whereas Hindmarsh managed only 137 votes. Included in Light’s votes were 115 from John Morphett. Later Light would write in his journal, ‘The reasons that led me to fix Adelaide where it is I do not expect to be generally understood or calmly judged of at present. My enemies, however, by disputing their validity in every particular, have done me the good service of fixing the whole of the responsibility upon me. I am perfectly willing to bear it; and I leave it to posterity, and not to them, to decide whether I am entitled to praise or to blame’. During November the first building was started at Glenelg. It was a storehouse of Thomas Gilbert. It would store all the surveying equipment, gunpowder and supplies as well as numerous seeds to start a garden. On 28 December the governor arrived and officially proclaimed the Colony. When the new years festivities were over and done with, Light’s grossly understaffed survey team set up camp on the corner of North and West Terraces and started the survey of Adelaide. On 7 February he had finished his map on which he had written, The dark green round the town I propose to be reserved as Park Lands. The survey was completed on 10 March when he had marked out 1042 city lots, seven hundred one-acre sites south of the Torrens, and 342 in North Adelaide. The plan, which included a central, plus four other squares and seventeen main streets, was later adapted for many townships in South Australia and even overseas. Two weeks later all of the streets had been named. Light also suggested the digging of a canal from the Torrens River to Port Adelaide. When the Adelaide survey was completed they set about surveying country sections, which were urgently required to make it possible for farmers to put in a crop. But progress was slow due lack of equipment and trained staff. Next came harbour sites, townsites and main roads. Without any form of transport Light, Fisher and other members of the party walked to Port Adelaide, Adelaide Hills, Encounter Bay, Gawler and the Barossa Valley. Work was slowed down even more as a large increase of migrants needed the supplies sent out for the surveyors. There was much friction between Hindmarsh and Light, which eventually resulted in Light resigning in June 1838. Almost all members of the survey party supported him and also resigned. Light and Finniss set up their own private surveying company, Light, Finniss and Co. They had more than enough work and completed a survey at Lyndoch Valley as well as some other towns even though Light was very ill. Governor Hindmarsh was recalled and replaced by Colonel George Gawler who had arrived on 12 October 1838. It did not mean that relations between the Government and Light improved, as the Gawlers did not approve of Light’s relationship with Maria Gandy. Gawler tried to get the surveying going again and appointed Charles Sturt as Surveyor General at a salary of six hundred Pounds. As Sturt had to go back to New South Wales to organise his own affairs Gawler took on the job himself until Sturt’s return. In an effort to clear his name, Light wrote a letter in July 1839 which was published in England in the Morning Post. In it he said, ‘I am so ill that I feel I shall never recover, and I only pray that the Almighty may spare my life long enough to vindicate my character against all the aspersions that have been thrown against me, and to lay before the world the infamous accusations of neglect of duty I have received at various times from Mr Hill, and which ultimately drove me from the service. For this purpose I am about to return to England. No one could have worked more zealously and conscientiously than I did, and Mr Rowland Hill actually accused me of wilful neglect of duty and inattention to my instructions’. But there was worse to come. During one of their many trips, the houses of Finniss and Light at Thebarton were both destroyed by fire. Light lost most of his paintings, sketches, diaries and notebooks. Light became too ill to return to England and from this time, Light’s health declined rapidly. He died on 6 October 1839 from tuberculosis before being able to clear his name. Only Finniss and Woodforde were with him. The Rev Howard refused to visit the dying Light because of his relationship with Maria Gandy. A few days later his friends assembled to raise money for a memorial. The meeting was chaired by John Morphett who subscibed £20. It would take some time though before it was finally built. However, Light’s death did provide an opportunity for many of the problems, which had been festering among the colonists and officials, to be put aside and even solved. His funeral was on 10 October and his body taken for burial at Light Square. Inside the coffin was a brass plate inscribed, ‘Founder of Adelaide’. The ceremony at the square was watched by more than three thousand people, including many who had been so antagonistic to him. Maria Gandy, the sole beneficiary to his estate, paid all expenses but was not at the funeral. She died in 1847 also from tuberculosis which she had caught while nursing Light. Within two years of Light’s death it was realised that he had completed an almost impossible task in the time available to him and a committee was organised to collect further funds for the erection of a monument ‘to the memory of this estimable man’ in Light Square. The foundation stone was laid by James Hurtle Fisher on 18 February 1843. It had been designed free of charge by G.S. Kingston and was built by Samuel Lewis, builder of Hindley Street. The monument crumbled away very quickly and another was built in 1905. Finally a statue of him was erected on Montefiore Hill overlooking the Torrens and city he laid out. In 1835 Colonel William Light selected the location for the city of Adelaide and started his now famous design of the street plan. From Montefiore Hill where he first stood and surveyed the flat plain that was soon to become Adelaide he formed his 'Vision'. 'The reasons that led me to fix Adelaide where it is I do not expect to be generally understood or calmly judged of at present. ... I leave it to posterity... to decide whether I am entitled to praise or to blame'. What most don't know is that Light left a message in his city design for all future residents of Adelaide to discover. A message not easy to decipher, not known to many and only visible to those that really pay attention to "Light's Vision". Come and play "The Mystery of the Colonel's Ghost" at the Fringe '09 festival to discover Light's hidden message in an exciting GPS-based treasure hunt through the streets of Adelaide.